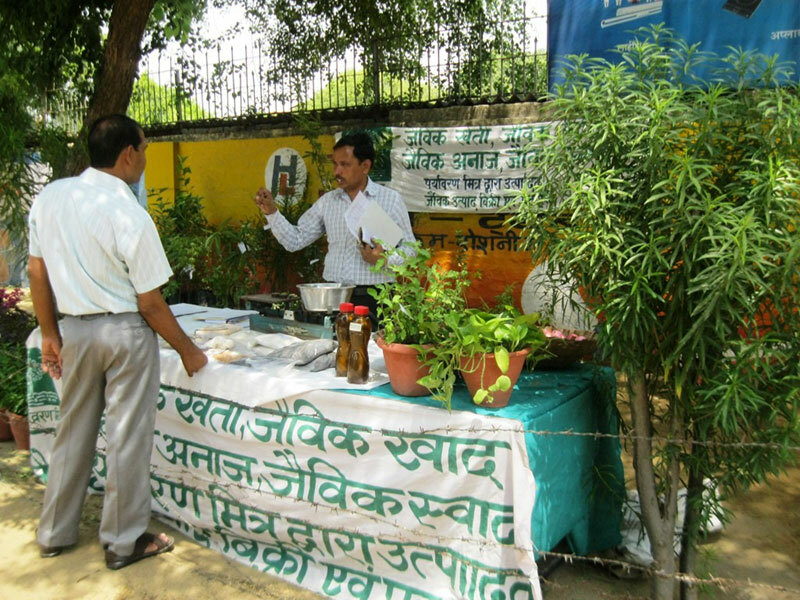 Paryavaran Mitra celebrated World Environment Day with an exhibition on Organic Farming and organic products at the main door of Hind Lamps, Shikohabad. The purpose of this event securely and confidentially was to acquaint people with the ill effects of chemically fertilised, genetically modified and processed foods and the benefits of organic farming. As a part of this drive, the stalls displayed and retailed a variety of potatoes, onions, wheat, pulses, mustard, seed oils and more. There was a display of flowers, fruits as well as plants that grew into shade providing trees. The visitors were informed about the harmful effects of processed foods and how they damage the environment including our soil. Organic farming was presented as a solution to promote good health and preserve our environment. The occasion was highlighted by the planting of a mango tree in the Hind Lamps area by Mr B.B. Mukhopadhyay, Vice President, Hind Lamps Ltd. Shikohabad. 1. Agriculture scientists demonstrating and explaining the benefits of organic farming. The planting of a mango tree at Hind Lamps.